(Vaters Namen und Kondition oder Karakter.) Amadeus / Wolfgangus / Mozart / kk. Hofkapell- / meister. (Anmerkungen.) Maria Anna / Kautelkin. The printer Johann Thomas von Trattner, who in 1784 had already officiated as godfather of Karl Thomas Mozart, could not attend the baptismal service, because he usually spent the summer in his country house Altlerchenfeld No. 12 (today about Josefstädter Straße 71). This estate which had originally been built by Count Franz Sigmund von Lamberg (1663-1713) was purchased by Trattner in 1785 for 80,000 Gulden. His second wife Therese, the dedicatee of Mozart's piano sonata K. 457, died there on 12 July 1793. Trattner's second suburban office at Josephstadt 145 (today Albertgasse 35), which was built in 1768 (A-Wsa, Unterkammeramt B2/8, Nr. 995), was used for the housing of workers and the storage of paper and its raw material (the so-called "Strazzen") (A-Wsa, Steueramt B34/25, fol. 317f.). The two suburban facilities of Johann Thomas von Trattner's printing business on Joseph Daniel von Huber's 1778 map of Vienna: on the left Altlerchenfeld 12, on the right, across the Kaiserstraße (today Josefstädter Straße), the house Josephstadt 145. Trattner's factory building at Josephstadt 145 listed in the 1788 tax register. Apartment No. 6 on the first floor is given as "Hadermagazin" (rag depot) (A-Wsa, Steueramt B34/25, fol. 317). 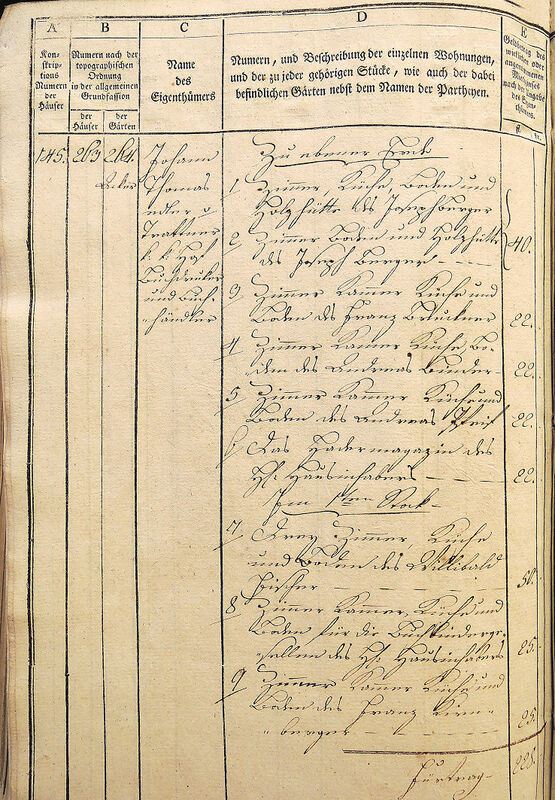 The names of the prominent godfather and his substitute, the bookseller "Michael Klorf" were duly copied into the later baptismal register with the words "dessen Stelle vertrat" translated into "Loco illius". The mysterious bookseller "Michael Klorf" has never been identified. As a matter of fact, this person has achieved a somewhat special status, because searches in Google Books and in Viennese archival records show that the name "Klorf" is absolutely unique and seems to appear only once, namely in Franz Xaver Wolfgang Mozart's 1791 baptismal entry whence it entered the Mozart literature. The explanation for this strange phenomenon is surprisingly simple: the entry in the baptismal register is flawed and a person named "Michael Klorf" never existed. The real name of Trattner's employee and substitute was Michael Klopf and he was not a bookseller, but the head accountant at Trattner's printing company. Michael Klopf was born around 1764 the son of the soldier Georg Klopf and his wife Gertrud. The fact that Michael Klopf's parents did not get married in Vienna makes it difficult to document his early years and to ascertain his relation to other people of this name. Klopf's earliest appearance in the records is the entry concerning his marriage on 28 October 1787 at the Piarist Church of Maria Treu to Magdalena Holzinger (b. 30 September 1763). Klopf's best man was Joseph Kestner, the executive director of Trattner's printing company. The bride was the daughter of Klopf's landlord, the Bavarian butcher Johann Georg Holzinger (1709-1801), who owned the house Josephstadt No. 34 (A-Wsa, Steueramt B34/25, fol. 77), "Zum Römischen Kaiser" ("At the Roman Emperor", today Lange Gasse 36, torn down in 1891). 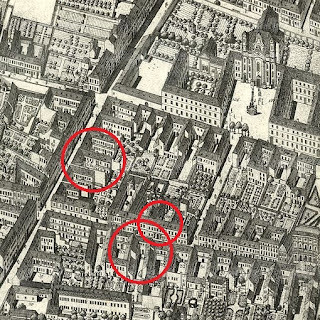 Three of Michael Klopf's documented residences: on the left the house Josephstadt 95, "Zum Weißen Hahn" ("At the White Rooster"), where Klopf died in 1811, in the foreground Josephstadt 34 where he lived at the time of his marriage in 1787 and above that Josephstadt 100, "Zum goldenen Kranz", where Klopf lived in December 1801 at the time of the death of his father-in-law. 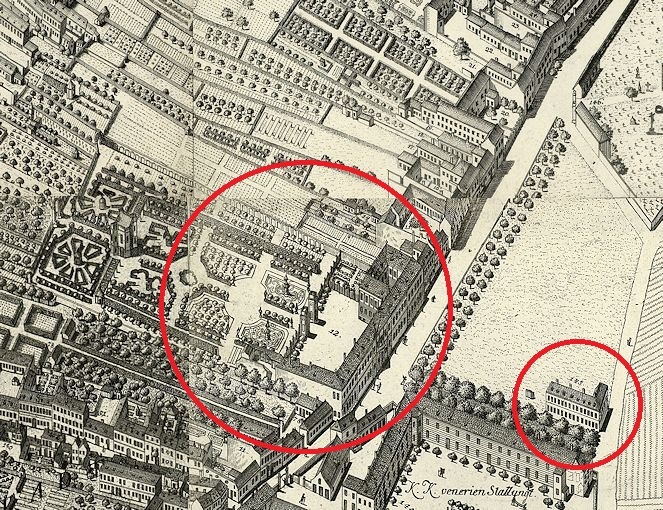 The Piarist Church of Maria Treu is at the upper right. 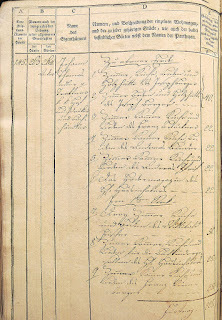 After Johann Thomas von Trattner's death on 31 Juli 1798 Michael Klopf stayed with the firm which was taken over by Trattner's grandson Johann Nepomuk Thomas (1776-1845). 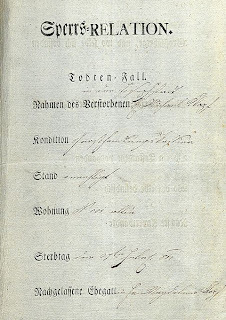 On 11 April 1805 Klopf and his wife Magdalena signed a belated marriage contract which amounted to an agreement of conjugal community of property and mutual inheritance. Michael Klopf's last appearance in the archival records of the Trattner company is his signature as a witness on a certificate of indemnity, issued on 5 January 1811 by the Viennese merchant August Mathes who for 25,000 Gulden had bought Trattner's paper mills in Ebergassing. Seven weeks later, on 27 February 1811 (on the same day as the horn player Joseph Leitgeb), Klopf died of "Lungenbrand" (pulmonary gangrene, a symptom of tuberculosis) at the house Josephstadt No. 101, "Zum Weißen Hahn" (today Josefstädterstraße 22, torn down in 1879). Klopf's estate was estimated at 2,513 gulden. It consisted of 2,020 gulden in cash, a silver watch worth 25 fl., 219 fl. in clothing and linen and 249 fl. in "Hauswäsch" (table clothes and sheets) and furniture. On 1 March 1811 Michael Klopf was buried in the Schmelzer Friedhof. It was not possible to determine the date of death of Klopf's widow. She probably married again after the death of her first husband. Owing to the fact that the date and the location of the wedding of Klopf's parents are still unknown, it was not possible to determine Klopf's genealogical relation to several other individuals of that name who lived in Vienna in the eighteenth century. The most interesting among them is the violinist and dancing master Lukas Thomas Klopf (20 May 1724 – 17 February 1780), brother of the musician Mathias Klopf (1722-1798) and son of the chocolate maker, confectioner and musician Johann Andreas Klopf (ca. 1695-1752). The entry concerning the baptism of the musician Lukas Thomas Klopf on 20 May 1724. The address "in d Eÿl" refers to the house St. Ulrich No. 9, "At the golden Owl" where Joseph Leitgeb lived 40 years later (St. Ulrich, Tom. 19, fol. 28v). Since Lukas Klopf's son and grandson were printers by profession, a family relationship with Michael Klopf seems likely. Lukas's son Ulrich Klopf (b. 5 September 1768), died a "privilegierter Buchdrucker" at the age of ninety on 27 May 1858 at Spittelberg No. 130. A certificate, issued on 21 February 1792 by the printer Johann Martin Weimar, stating that Ulrich Klopf has learned the printing craft and as Weimar's employee has a secure monthly income of five gulden (A-Wsa, Mag. ZG, A3, 637/1792). Ulrich Klopf's son Franz Xaver (b. 1806), who owned a printing office, died on 10 January 1864 at Mariahilf No. 134. Franz Klopf in Adolph Lehmann's allgemeiner Wohnungs-Anzeiger of 1864. To figure out Michael Klopf's relationship to the family of Lukas Klopf will be the task of future research.